In a perfect world, we would be able to consume all of our daily vitamins without supplements. We could get our essential oils from freshly caught fish in our own nets or vitamins A through Z from the leafy greens thriving in our own greenhouse. But location, space, and simply life doesn't always permit. So we look towards compressed forms of nutrients which can include attempting to swallow a smelly vitamin the size of a hot dog. Here are three no-fail, easy ways to get your vitamins and maintain your health on the go. You can still dream about owning your own greenhouse, though. What's In Them Matcha to Go is a blend of Aiya’s ceremonial matcha and dietary fiber and they’re completely organic. How to Take Them The sticks come in an easy-to-open, single serve stick. Pour the powder directly into hot or cold water and stir. No need to sift or whisk as you would with regular matcha. To add some sweetness, try mixing in a small amount of light agave syrup. The Health Perks Green tea has been known to improve blood flow, lower cholesterol and risk of heart disease, improve brain function, and aid weight loss. What's In Them Aloha’s Daily Green Power’s primary ingredient is the superfood Moringa, one of the most nutrient-dense foods on Earth packed with 92 identifiable vitamins, minerals and phytocompounds (aka thyroid and immunity boosters). How to Take Them A month’s supply of powder and pre-sorted supplement packs arrive in a self-sealing pouch. Just open and mix with water, blend into smoothies, or stir into soups, or sauces. The Health Perks Each pack fulfills the two servings of fruits and vegetables recommended by the USDA and more, thanks to other good-for-you components including dehydrated coconut water, mushrooms, ginger, spirulina, and wheatgrass. 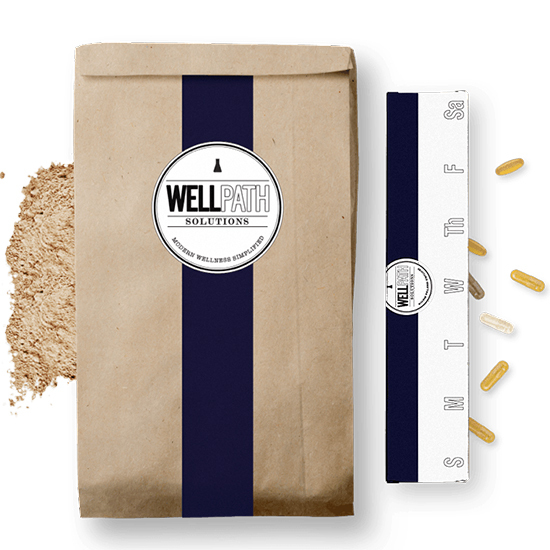 What's In Them Well Path is the world's first "online apothecary,” customizing pill packs and daily powder for desired effect or enhancements. What’s in them depends on you and an initial virtual consultation about your current health challenges, day-to-day routine, and goals. How to Take Them Custom powder packs arrive in a hand-labelled, sealed bag and can be mixed straight into chilled water, juice, milk or your favorite smoothie or health shake. The consistency of the vanilla protein powder cis perfect for creamy iced drinks. The Health Perks (Almost) totally up to you. The intake form lets customers pre-select benefits from a perked up libido and added mental focus to mood support and athletic performance.